“He worked himself to exhaustion on New Zealand’s successful campaign for a seat on the Security Council and earned an international reputation as a fierce and outspoken critic of UN inaction and paralysis. This is tough talk, and consistent with comments he has made about multilateral organisations throughout his tenure. But were these beliefs reflected in aid funding at all? 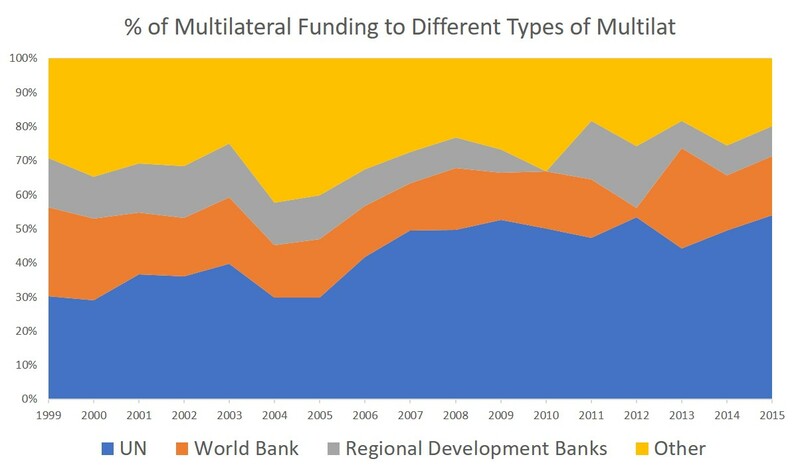 Funding to UN development agencies as a share of multilateral aid is shown below. (The World Bank is part of the UN in a sense, but is treated as a separate entity in the world of development). 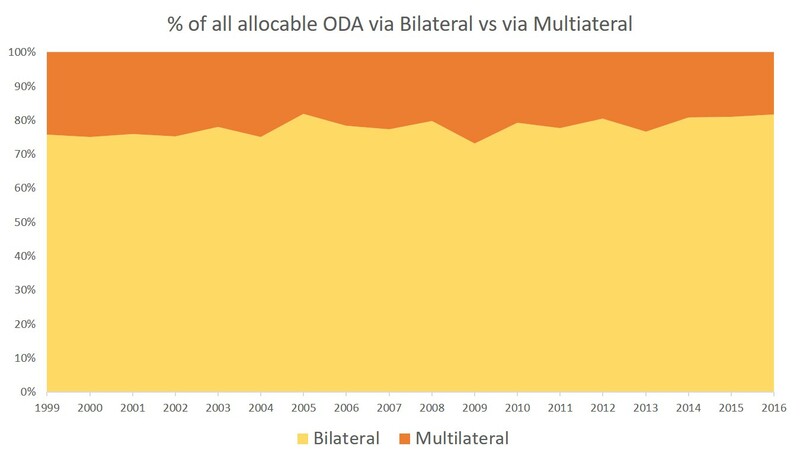 As you can see, amongst the different types of multilateral organisations that New Zealand gave aid to, UN development agencies did comparatively well under Minister McCully. I don’t think that’s a bad thing. But it’s an odd course of action for a ‘fierce and outspoken critic’ to take. Obviously there are some conceptual issues here. 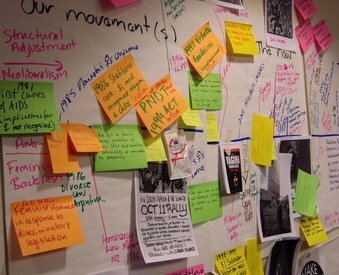 Is aid to improve education or eradicate diseases, or to change norms about domestic violence, any more of a handout than aid to build a bridge or a runway? Development is multifaceted. If you don’t get this, think about your own life. Was the education you received any more a handout than the roads you drive on are? Conceptual challenges aside, what about the empirical matter. What changes did McCully bring? 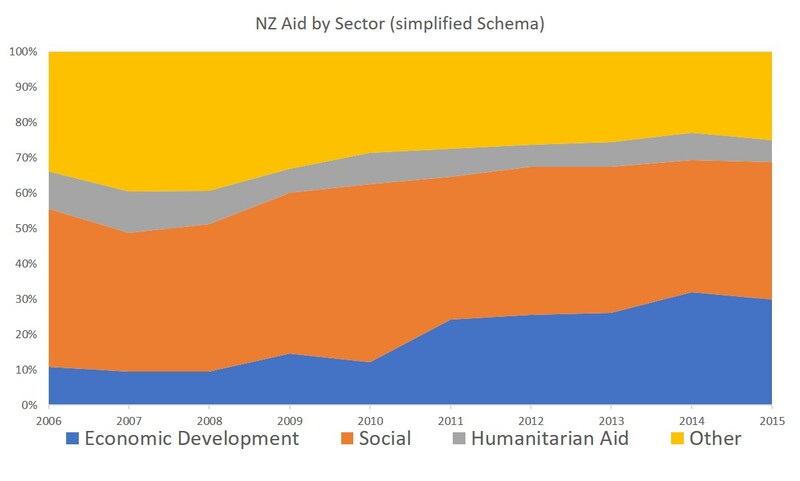 As the chart below shows, McCully did increase the emphasis on economic development in NZ’s aid spending. Economic development as a share of total sector allocable spending doubled from 2009 to 2015. That said, economic development is still not the largest spend; more money is devoted to social development (health and education, and the like). There was change, but it wasn’t a transformation. If you thought we were giving handouts before, the bad news is we’re still giving them now. If — like me — you think we should balance our aid spending priorities — the good news is we still are. That leaves us with the Pacific. For what it’s worth, I don’t know if Minister McCully actually had any critics to ‘stare down’ in this particular area. Most members of the New Zealand aid community have always thought we should give the lion’s share of our bilateral aid to the Pacific. As a result, we’ve done so for a long time. Minister McCully did not change this. However, during his time as foreign minister the share of New Zealand aid given to the Pacific increased, as the chart below shows. Before you start shouting, “take that criticz! stared you down! 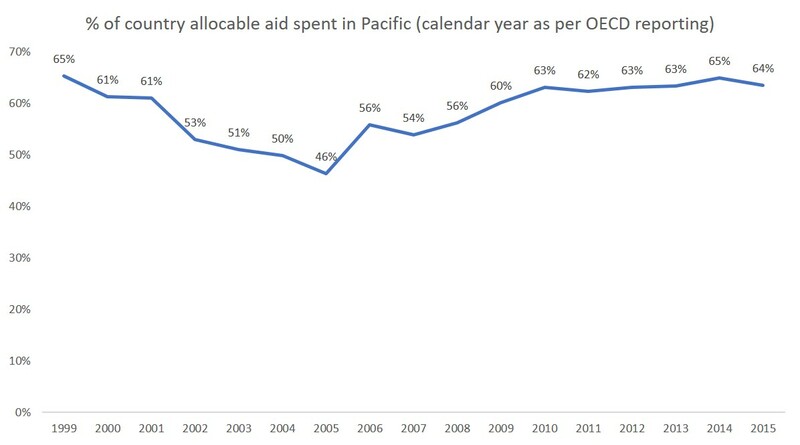 !”, remember that aid to the Pacific was already trending upwards when McCully took the helm. It had been doing so since 2005. Also note that the ‘McCully effect’ on aid to the Pacific is about 6 percentage points. Once again, this is not a transformation. Murray McCully did change aspects of New Zealand aid. I’m hoping to write about this more in coming weeks. But the largest changes he wrought were qualitative — to do with his leadership style and its impact on how well New Zealand gives aid — they weren’t quantitative. The direction and emphasis of New Zealand aid spending changed somewhat under Minister McCully, but the change was less dramatic than people think. As I said, I hope to write more. In the meantime, if you want a slightly-dated, but very detailed study of changes in New Zealand aid flows see here (or here for a summary). If you want to read the views of some New Zealand stakeholders see here. If you want last year’s New Zealand aid budget analysis see here.